A LRGB image of M106 with an Ha blend into the red channel. Along with the main galaxy (M106) and NGC4248 (bottom right), quite a few very distant galaxies can also be seen in the background. 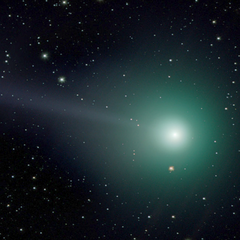 The total image integration time was just under 16 hours and was taken with my SW Esprit 150 and Trius 814 camera. CCDstack: calibration, registration, data rejection, deconvolution (L), DDP stretch. PS: colour enhancement, noise reduction, sharpening, mask generation, image blending. Neat Image: background noise reduction. Setup was: Meade ACF 10" with AP CCDT67 telecompressor, QHY163M camera and EQ6 mount. Guided with SW 80/400 + ASI290MM. 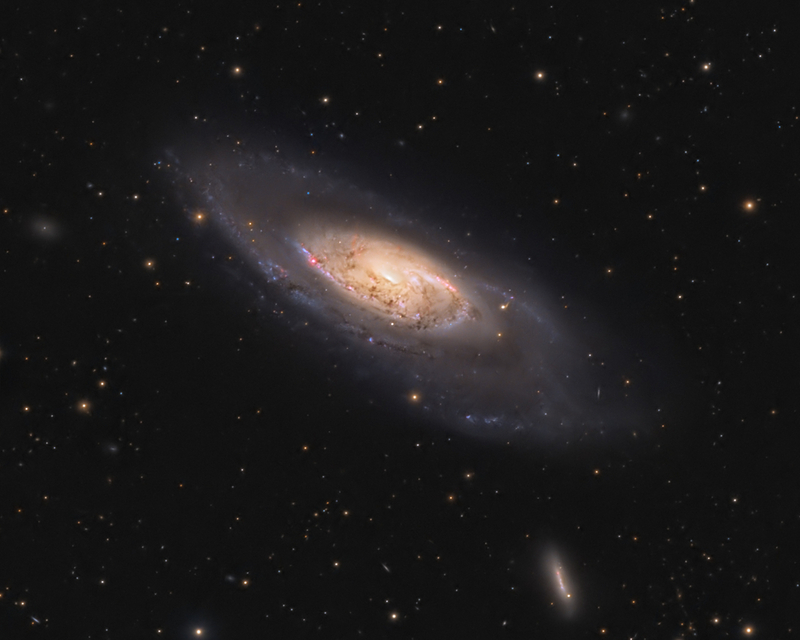 M106 details: LRGB 45:15:10:12 x 2 minutes. NGC4565 details: LRGB 100:15:10:12 minutes. A LRGB image of M106 with an Ha blend into the red channel. Along with the main galaxy (M106) and NGC4248 (bottom right), quite a few very distant galaxies can also be seen in the background. M106 is quite bright in Ha, so I decided to blend 6.5 hours into the red channel to obtain a more structural detail. The total image integration time was just under 16 hours and was taken with my Esprit 150. LIGHTS: L:14, R:14, G:13, B:15 x 600s, Ha:13 x 1800s, DARKS:30. BIAS:100, FLATS:40 all at -20C. This is the first "proper" image from my rebuilt 14" Newtonian - has been a long time coming, and more tweaking to follow, but pleased how it performed. I've made a light box which works well and used data from evenings of 13th/15th Feb to create this image (but this showed the R channel, I think, where the OAG impinges and throws an odd reflection and doesn't reduce nicely - need to sort.... :-/). This is M106 and NGC 4248 (and a load of other faint fuzzies including at least one z>1.0 QSO right at the far left edge of the frame, as well as lots of anonymous galaxies that don't feature in anything in Simbad/Vizier). North is roughly down in this image. ST2000XM (@-20C), 350mm double truss Newtonian @ f4.53 (1584mm FL), Losmandy Titan. Guiding via ASI120mm on OAG. Reduction and Processing in Pixinsight. The L channel behaved nicely; colour less so, and was a bit of a challenge to get it to behave, especially the background which I needed to be quite firm with to remove blotchiness. I think really the moral is: more data... a bit more colour (and lum!) data might allow a bit more from the outer reaches and a much smoother background, but clear skies are what they are... Haven't got any HA here to bring out the jets, but the brightest (above/south of the core) is just about visible. All comments/suggestions/improvements appreciated! Thanks for looking.